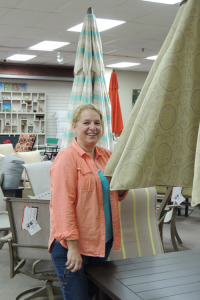 After 111 years, Telescope Casual Furniture in Granville is in the midst of a culture change. Telescope — and its 265 employees — are being remade into a more nimble, more efficient company with the help of Honsha, Inc., a consulting firm made up of former Toyota employees “teaching the Toyota way,” Mrs. Juckett said. It started in May, and will likely continue for another year or more. Previously, Telescope would have separate areas where furniture parts were bent, punched and drilled. In between, parts would sit unused, awaiting processing. Now, all those steps are done in a single “cell” of employees, eliminating moving the pieces around the factory floor. “Raw materials go into a cell,” she said, “and when it comes out, it’s done and ready to be finished. A saw that cuts aluminum rods into smaller pieces sits near lanes of parts that feed the welders. Welding fixtures are now arranged in order of highest usage, with the ones used the most closest to the welders. Assembly stations are now set up before shifts so assemblers can get right to work. Plus, Telescope has gotten into contract furniture, filling large orders for hotels and motels. The new “lean initiative” is already producing significant improvements in efficiency and productivity, said Telescope Casual Furniture CEO Kathy Juckett. 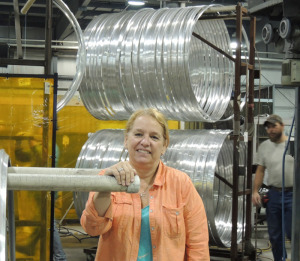 Behind her are table rims that have been bent into circles and are waiting for the next step in production. Telescope makes furniture with thousands of combinations of finishes, fabrics, frames and frame finishes. Being able to move efficiently between jobs is essential, Mrs. Juckett said. “People want choices,” Mrs. Juckett said. “They don’t want what everyone else gets at Lowe’s or Home Depot or Walmart. They want something unique to them. She said they are a third of the way through the “lean” transformation, “and we are already seeing significant changes. This definitely works. Employees who have already gone through it see it. And employees who have yet to go through it are excited, because they see results in other areas. “This will be a permanent change. The system works because there are huge continuous improvement factors built in. You are constantly evaluating your processes, and because of that you are continuing to improve. “As a business, if you don’t change, if you don’t keep up with what is going on, you won’t survive. And change is particularly complicated here, where things have been set in stone for 111 years.